Marrakesh was on my bucket list for many years and one of the reasons was to stay in an authentic Moroccan riad. 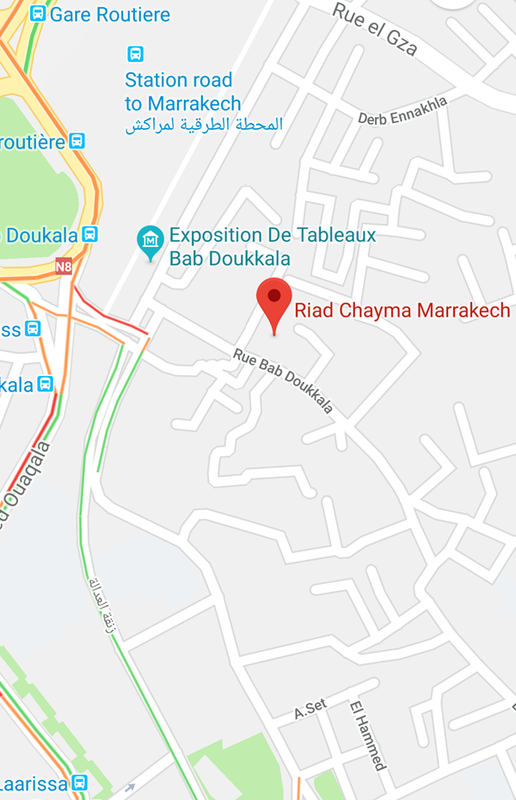 Riad Chayma, is an English owned hotel that combines perfectly the authentic Moroccan hospitality with traditional Moroccan architecture, making the visitor understand from the very first moment why this riad stands out among the hundreds in the city of Marrakech. 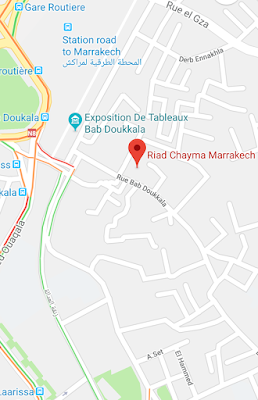 Riad Chayma boasts a particularly convenient location, surrounded by the walls of the Marrakech Medina, but at the same time very close to the new city. The famous city square, Jemaa el Fna, the impressive Ben Youssef Madrasa, Kotoubia Mosque, as well as the beautiful Majorelle gardens, are about a 15 minute walk away. 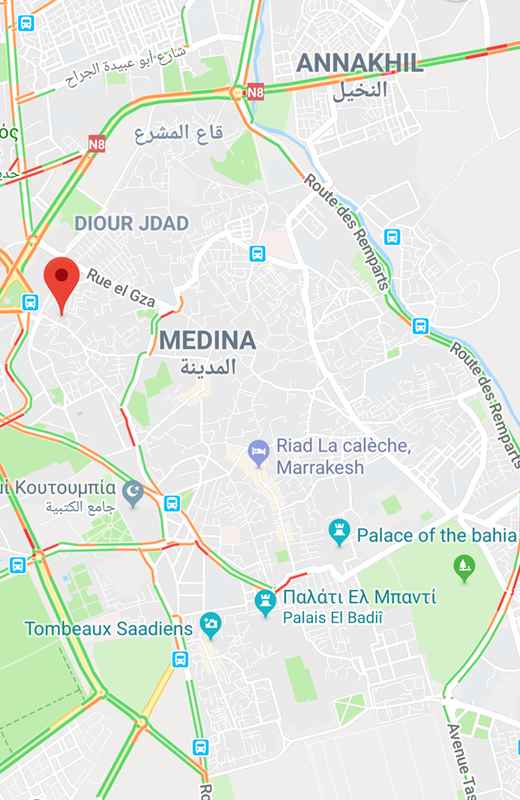 Bab Doukkala street, where the riad is located is one of the busiest streets of the Medina. It's a large pedestrian street where someone can find great Moroccan street food, spices and handmade products at much better prices than in the shops around Jemaa el Fna. There are two things that I noticed in Riad Chayma from the very beginning. The first was the lovely staff that was always smiling and willing to help us with everything we needed. Upon arrival, they welcomed us with wonderful mint tea, maybe the best we tasted on our trip to Morocco as well as with countless useful tips about the area. 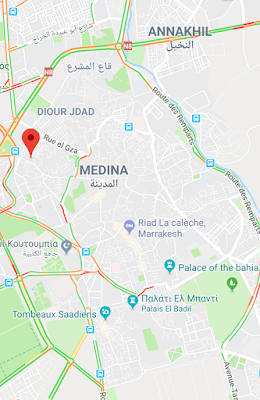 The second was that although the street next to the riad was so busy that it is hard to describe in words, when you enter the riad and close the door behind you, you are automatically transferred to an incredibly peaceful environment. My surprise was even bigger the next morning when, in the heart of one of the most chaotic cities in the world, I woke up from the singing of the birds that broke the absolute silence that prevailed along the space. Riad Chayma consists of 5 beautiful suites, each of which has its own special decoration. We stayed in the orange suite, which, as its name suggests, is decorated in tones of orange and blue. What I loved most in our suite were the beautiful handmade Moroccan lamps, which give a sweet warmth combined with a sense of magic into the room! Also, as a very practical person I really appreciated the king, comfortable bed, which was one of the best hotel beds I've ever slept to! Breakfast is served in a lovely area, on the terrace. What I loved in Marrakech was the wonderful weather that allows you to eat your breakfast enjoying the beautiful views and the warm sun even during winter months! Breakfast consisted of mint tea, fresh orange juice, fruit salad, yoghurt, scrambled eggs, Moroccan crepes and tasty jams. One of the most beautiful places of Riad Chayma is the courtyard in which we walked straight out of our room. The courtyard is like a small oasis which is decorated with beautiful metal lamps, plants and also a small fountain in the center that makes you feel immense tranquility. I could sit in this yard for hours enjoying my mint tea, listening the birds singing. At the edge of the courtyard there is a small yet beautiful swimming pool, which I would definitely have enjoyed most if I had visited Marrakech during summer. The roof terrace, where breakfast is served, is also a great place for guests to relax on the sun loungers or in the lounge after a tiring day. Disclaimer: We were guests of Riad Chayma. As always, all opinions expressed are my own!